Spent time with (both) father-in-laws (Christmas Day and the 26th). Going to Morrison, IL on the 26th gave us a chance to use the new GPS. Spent some time figuring out how to build PHP 5 on Solaris 9. Found out that I did not build shared SSL libraries on the machine, which prevented building. Once these were built, everything worked fine. There was a bit more, but I think this sums it up. It was nice to work on work related things that needed to get done on my own schedule. Definitely learned a lot. As always, family time was awesome all around. Aside from all of the commercialism, I really do like the family aspects of the holidays. I’ve fixed the ‘Most Popular Posts’ section over in the sidebar. It now reflects actual most popular, rather than adding weight to home page views. I finally bit the bullet and took the time to get the blog to a higher resolution. Wasn’t as hard or time consuming as I had built it up to be in my head. Hopefully the extra room works for everyone. New El Camino In The Works??? Jonna shot over this link about a possible new El Camino coming out. For some reason, I don’t like it as much as the 80’s model. This was on a trip to Springfield when we were young. 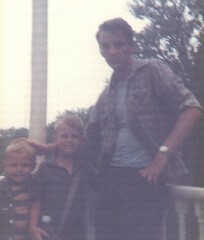 Left to right, my brother Ed, myself (with a brand new canteen), and our father. I just realized that today would have been my fathers 66th birthday. Happy Birthday Dad – we all miss you.